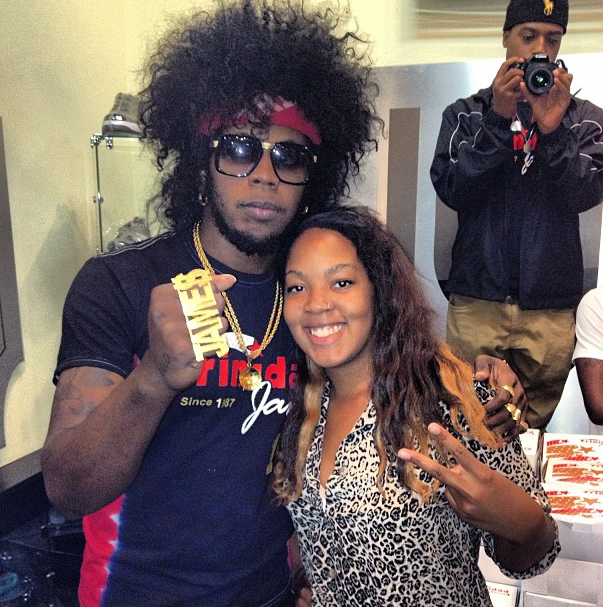 Trinidad Jame$ Sells $30 Chicken at Fly Kix in ATL! Last night at Fly Kix ATL artist Trinidad James hosted a meet and greet to celebrate the release of his sophomore mixtape 10 Pc. Mild. It was a dope event and Trinidad was a very cool, down-to-earth dude. Lots of artists came out, including Cyhi The Prynce and Chiiirp. The thing I found the most interesting, however, was the $30 boxes of chicken wings. Yes, you heard me right: thirty dollars. Trinidad scored a deal with American Deli, one of his favorite restaurants, to have the Trinidad James special in their stores. [The Trinidad James Special includes 5 pcs. of chicken for $3.99.] However, the chicken was a little more costly at the meet and greet as the boxes, seen in the picture above, could be autographed by Trinidad himself. I suppose if I was a Trinidad James stan I would shell out 30 bucks for authentic all-gold-every-wings. *slaps knee* All in all, I can’t hate. It was an awesome event and interesting marketing concept. Check out the mixtape below and let me know what you think of it! Trinidad James – 10 Pc. Mild – NoDJ.